Many parents struggle to find a swim-lesson provider who is the right fit for their children because they know the water is scary, and experiences in the water have the potential to leave a lasting life-impact. while building their confidence and resilience for overcoming life’s challenges. We begin with a discovery assessment of each student, which provides the starting point for building their swimming skills. The journey to mastery begins by gently building trust with your child; guiding them to relaxing and having fun in the water, creating the perfect mental and emotional learning environment. We will guide your child step-by-step to master the skills of breathing, balancing, kicking, and pulling while growing their courage along the way. Becoming One with the Water is an achievement worthy of celebration! The One with the Water community will celebrate your child’s success. Our instructors use this opportunity to be a positive role model to your child, building up their self-confidence, courage, and life-resiliency. Watch Angela Describe Her Daughters’ Amazing Transformation! Below are some of the most commonly asked questions regarding our Kids and Babies Swimming Lessons. If you have any specific questions that are not answered here, contact us and we will be happy to answer them. We are expert in both teaching and swimming. Most of the One with the Water instructors have over 20 years of experience teaching swimming lessons as well as competing. We teach the best and most efficient approach to the most pertinent skills of swimming: Breathing, Balancing/Floating, Kicking, and Pulling. We break it down to simple, achievable goals to help everyone succeed. We get to know you as a person, including your fears and your strengths. Instead of wasting time on eliminating or minimizing your weaknesses, we work with your strengths to help you achieve your goals quickly. We make you feel comfortable and secure. We are certified and accredited coaches with over 10,000 hours of experience. A swimsuit and a towel is all that is needed. No flotation devices, flippers, masks, goggles, etc., are necessary. We can provide swim caps. Should my child eat before the lesson? Please, no food or drink at least ½ hour before a lesson. If your child does need to eat, it is best to eat without liquids—that way the food and nutrients are quickly absorbed. All of the pools we use are heated to a temperature of 82 - 86 degrees. What days of the week are lessons available? We teach every day of the week, and at public facilities depending on pool permit hours. We teach at several local pools year-round. We schedule the lessons around your calendar to meet your needs and help you reach your swimming goals. Parent & Me classes start at 4-months old, and most of our semi-private lessons are designed for children aged 18-months and up. As part of the course in the Parent & Me Swimming Classes, your child will start to go under water unless they exhibit a fear of doing so. All children start lessons with an introduction to water being poured in a very small amount from the top of their forehead and down their faces, for no more than 1 second, which gets increased gradually. After a 5-second pour, children are usually ready to submerge for a few seconds. We never force a child to go under water. If your child is coughing after they go under, we highly recommend no more than 3 attempts during the lesson to put their head under the water. We do not physically force any child to put their heads underwater. Please read this blog post about this method. As part of the course in the Parent & Me Swimming Classes, and all of the swimming courses, your child will learn to turn over onto their back from their stomach. As stated above, it is best to try this no more than 3 times during each lesson. 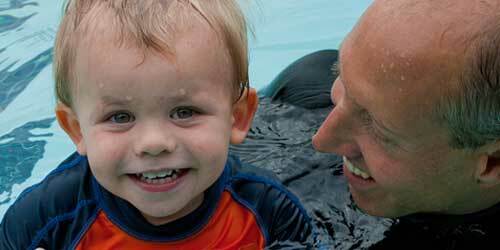 For Parent and Me Swimming Classes, at least one person will get in the water with the child. For kids at least 18 months or older, we try to teach them without the parent present in the water, or at least until the child becomes comfortable with us. During the latter part of the course we may invite you into the pool to swim with your child, to teach you how to continue helping them learn to swim. Yes, lessons are held daily regardless of the weather, unless there is thunder and lightning. You will be getting wet anyway. And it's really fun to swim in the rain! To help us fulfil our scheduling obligations, please be aware of the following cancellation policy. As a common courtesy, we ask that all cancellations be communicated via email or by calling the Swim Line at +1-323-364-SWIM (7946). Please make every effort to attend all lessons. Pool space, insurance & instructors are booked 1 month in advance. Refunds are not issued for missed lessons. We can convert missed lessons into a tax-deductible donation. If you cancel your registration more than 30 days before your lessons begin, you will receive a full refund minus a $25 processing fee, issued as a refund to your credit card unless you paid by check. If you cancel within 30 days before your lessons begin, we are unable to provide a refund but will work with you to schedule another session or convert your payment into a tax-deductible donation. For the monthly membership fee, you are guaranteed either 4, 8, or 12 lessons, depending on the package in which you enrolled. For months with additional days, when 5 Saturdays, Sundays, or Mondays, etc. occur, the rate will remain the same. When a pool closure occurs and there are only 3 or 7 lessons, you will receive a credit to use in the upcoming month. Refunds will not be issued. Cancellation by One with the Water® - On the rare occasion that One with the Water® cancels a lesson, due to circumstances beyond our control (emergency pool closure, contamination, severe weather—we swim in the rain, swim meet, etc. ), you will be entitled to a makeup lesson. We may substitute an instructor if necessary to avoid cancellation on our part. Register Now to Get Started in Your Local Swim Program!